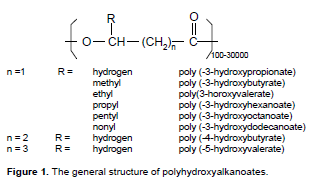 These area ll polymers based on hydroxyalkanoates - alkanes of all sorts with both acid groups and hydroxy groups. The problem I have is that in the picture above, n = 0 should also be an option. If it is and R = hydrogen methyl, then you have another biodegradable polymer, polylactic acid aka PLA. So why isn't PLA considered a PHA? Blame it on the biologists. Practically all background discussions on PHA's mentions how these polymers are derived from bacteria, usually as the little bugs are put under stress. PLA isn't made that way and so apparently that is enough of a distinction to cut it out from the group. It's a pretty strange way to slice it if you ask me. Update: Corrected the value for R to correspond to PLA, not PGA - see the comments from Barney below. [*] ADM and Metabolix recently announced that their joint venture to make and sell PHA is ending immediately. Not a good sign for the commercial success of this polymer. I agree, though I always thought PHA got used for poly([beta]-hydroxyalkanoates)--the [beta] is probably too easy to lose. Thanks for both comments. I was never aware of any β, and will correct the -R groups for n = 0.